Subduction zones are plate tectonic boundaries where two plates converge, and one plate is thrust beneath the other. This process results in geohazards, such as earthquakes and volcanoes. These hazards affect millions of people around the world, particularly around the edges of the Pacific Ocean, which mainly consist of subduction zones. The largest earthquakes on Earth occur at the interface between the two plates, called the megathrust. Recent examples include the magnitude 8.8 earthquake in Chile in February 2010 and the magnitude 9.1 earthquake offshore Sumatra in December 2004; the latter triggered a devastating tsunami. Earthquakes are caused by movement over an area of the plate interface called the seismogenic zone. This zone ‘locks’ between earthquakes, such that stress builds up. It is then released catastrophically in one or more earthquakes. Above and below this area on the fault, stress cannot build up, and the movement between the plates occurs relatively smoothly through time, and thus does not produce large earthquakes. To improve our estimates of the likely damage that would be associated with an earthquake in a given location, we require better constraints on the size of the seismogenic zone, particularly the location of the lower limit. 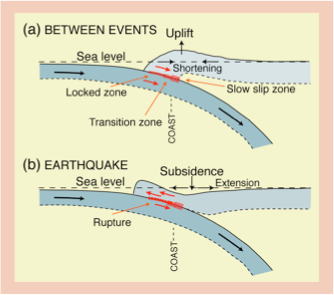 Cartoon showing cross section through subduction zone before an earthquake (above) and during an earthquake (below). Before the earthquake, stresses builds up on the part of the megathrust that is ‘locked’. This also causes the overriding plate to warp in response, such that the surface of the earth goes down near the trench, and the surface of the earth goes up farther inland. When an earthquake occurs, the locked zone ruptures, causing uplift near the trench and subsidence farther inshore. The ~2500-mile-long Alaska/Aleutian subduction zone stretches from Russia in the east to Alaska in the west. Here, the Pacific Plate and the North American plate are moving towards one another at a rate of ~6-7 centimeters (or 2-3 inches) per year. The Pacific Plate is thinner and denser, so it is being thrust underneath the North American plate. This subduction zone has generated many large, devastating earthquakes, including the second largest earthquake ever recorded: the magnitude 9.2 Good Friday earthquake in 1964. Not only did ground-shaking and landslides associated with this earthquake devastate Anchorage and other Alaskan towns, the resulting tsunami caused deaths as far away as California. Our project focuses on the plate boundary between the Shumagin Islands (at ~162ºW) and Kodiak Island (at ~152ºW). In particular, we are concentrating on the Semidi segment, which last ruptured in a great earthquake (magnitude 8.3) 72 years ago in 1938. This area has a recurrence interval of ~50-75 years, and thus might be due to produce another big earthquake soon. Above: The Alaska/Aleutian subduction zone in the northern Pacific Ocean. 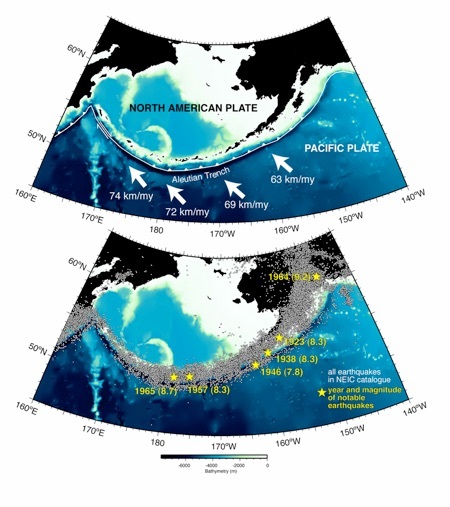 The Pacific plate is being thrust beneath the North American plate at a rate of ~6-7 cm (or 2-3 inch) per year. Rates above given in kilometers per million years. Below: Many earthquakes occur along this boundary, both on the contact between the plates and in the overriding North American plate. These include great earthquakes (yellow stars) such as the magnitude 9.2 Good Friday earthquake in Prince William sound.